Occasionally, a massive currency swing allows an arbitrage opportunity when booking flights, hotels, and other travel products priced in a declining currency. This is certainly true this evening. 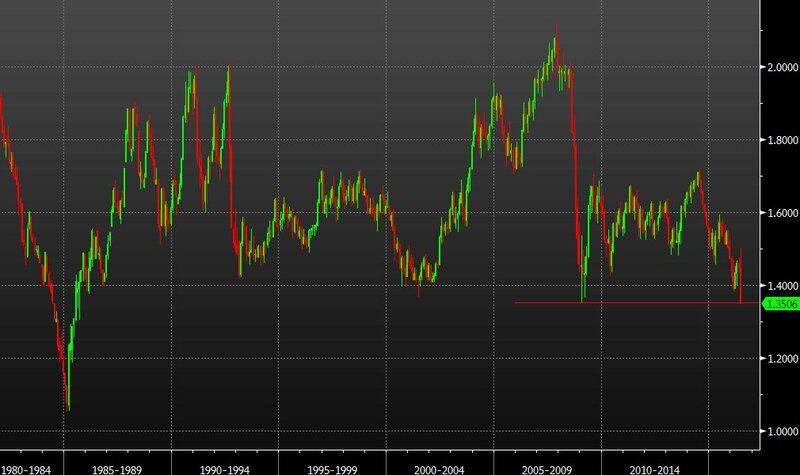 As of this writing, it looks like the UK has voted to leave the European Union and panicked currency traders are dumping the British pound. The last time this happened was in December, 2014 when the Russian ruble suddenly plunged. However, this was harder to take advantage of last time, because you had to book through a Russian travel agent and book a fare that was listed in Russian rubles. There were some great deals, but mostly on Aeroflot and Turkish Airlines. The largest drop in the GDP… ever. It’s a whole different ball game this time. It’s fairly unusual that the currency of a modern, developed European economy collapses by 10% overnight. All sorts of travel products are priced in pounds and virtually every airline in the world has pound-based fares. Hotels sell rooms priced in pounds. Tour packages are available as well. And at least until prices reset tomorrow, you can save 10% off or more if you book on a UK travel site and pay in pounds. Note that you need to book and pay now to lock in the savings. I like LastMinute because their prices are generally very good anyway, and they’re especially so right now. Opodo is another good option. Remember if you’re buying things priced in pounds, your bank may charge you a foreign currency conversion fee. Capital One cards don’t have this fee, HSBC Premier WorldMastercard doesn’t have the fee, and several airline credit cards also don’t have this fee. If you’re not sure, check with your bank: you’ll still come out ahead, but conversion fees can eat 3% of the savings. 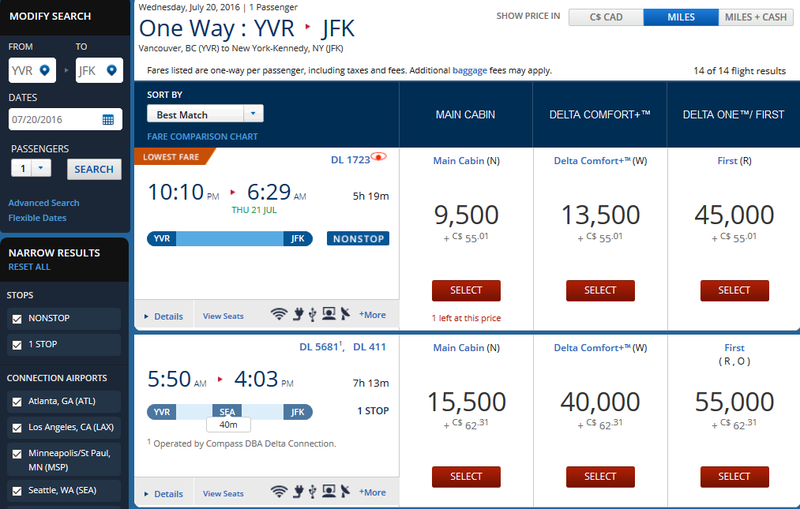 When Delta did away with their award charts earlier this year, most people assumed that no good could come of this and it would effectively lead to a Southwest-style award chart that is based on the price of the ticket. In my mind that wouldn’t necessarily be a bad thing, because it makes award pricing more predictable and you can more accurately predict what your miles are worth. However, it would also take away the “sweet spots” which provide some of the best value in frequent flier programs. Instead, I have found the results to be decidedly mixed. Award pricing for premium cabins is often just silly, and it’s never particularly good. However, when flying economy class, there are now some incredible sweet spots in the Delta award chart yielding value of over 3 cents per mile. This seems to be based on the available inventory on the flight versus the the price of the flight, which is an important distinction. Delta may want to maintain high cash fares in a market, but will let SkyMiles seats go cheaply if they’ll likely otherwise go unsold. After conversion, the cheapest fare is nearly USD $300. This was an absolute no-brainer. Even with the hassle of driving from Seattle to Vancouver to catch the flight, it was an absolute steal. The value rang up at over 3 cents per mile! While you can theoretically get higher value booking premium cabins on certain international flights, most of these are fares that nobody would actually buy. But if you want to get from the West Coast to New York this summer, it’s going to cost you a minimum of $500 roundtrip in actual, real money. So this isn’t a theoretical value, it’s an actual one and I consider it a very good result. The return flight was a slightly more complicated decision. The latest Delta flight out from New York to Vancouver leaves just before 7:00PM. Catching it will mean that I’ll have to leave the conference I am attending about two hours before it ends. And it’s not as good a deal: it costs 15,500 miles for a USD $310 fare. This is still a redemption value of 2 cents per mile, though–and overall pretty good. The total roundtrip price was 25,000 miles, which worked out to an overall redemption value of about 2.4 cents per mile when factoring in what comparable flights from Seattle would have cost and subtracting the taxes I had to pay out of cost. The usual value of Delta miles is about 1.2 cents per mile, so this is a very solid redemption. However, Cathay Pacific also operates a flight from New York to Vancouver, which provides an intriguing option. It’s a Fifth Freedom flight on an internationally configured widebody aircraft, and it leaves a little later–just after 9pm. And I could have redeemed 17,500 Alaska Airlines Mileage Plan miles to take it. However, it would have also cost me an additional $27.50 in call center and partner airline ticketing fees (Cathay Pacific awards aren’t bookable online), and I’d have landed in Vancouver at 12:10am facing a long, tiring drive to Seattle after that. Additionally, Cathay Pacific doesn’t allow advance seat selection. The last time I took this flight, I was stuck in a middle seat on a bulkhead row next to an overweight woman and it wasn’t even a little bit fun. The flight was available for a cash fare of about $280, but subtracting out the fees and taxes, and I’d be getting less than $250 of value for 17,500 miles. That’s a value of 1.4 cents per mile, which just isn’t a good one for Alaska Airlines Mileage Plan miles. These can be redeemed for much more valuable itineraries. It might have been worth 20,000 Alaska Airlines Mileage Plan miles for Premium Economy, which is actually a very nice product on Cathay Pacific. However, there wasn’t any availability–just regular economy, which honestly isn’t a much better product than Delta offers. So I went ahead and booked the Delta flight. I have said it before and will say it again–if you live near a Canadian airport and can fly from there, don’t forget to check the options if you’re having trouble using your miles! You’ll pay slightly more in taxes (it costs about $30 additional from Vancouver versus flying from Seattle), but might open up availability that simply doesn’t exist otherwise.